Shut the storybooks you thought you knew because now you can Choose Your Own Ever After™! At Ever After High™, the teenage sons and daughters of famous fairytales decide whether or not to follow in their parents’ fabled footsteps and have lots of their own adventures along the way. Raven Queen™, Cerise Hood™ and Blondie Lockes™ are starting a chapter outdoors with plans for an enchanting picnic. All three look spellbinding in gorgeous gingham dresses with signature style and iconic touches. 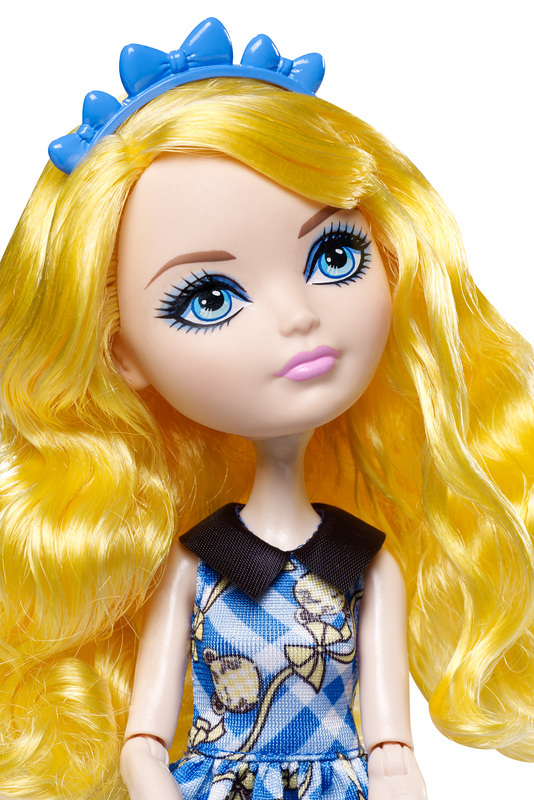 Blondie Lockes™ doll, daughter of Goldilocks, looks just right in blue gingham with yellow bows and bear silhouettes, a black collar and yellow ruffle hem. Black wedge sandals with bows, a blue headband and a basket-weave teddy bear purse complete the charming look. Collect all of the dolls for hexquisite display and storytelling fun (each sold separately). Doll cannot stand alone. Colors and decorations may vary.